To find out the password stored in the ADSL Modem(HUAWEI) in case you have forgotten it. Click on the note icon next to green arrow marked as Default Route for some PVC Number. Most probably it is PVC 0.It will generally be a pppoe connection. PPPOE properties windows opens where you can see the username.The password will be hidden under asterisks. Now select the text Password and the entire row and right click on it.Choose View Selection source.Click on the following image to see the screenshot in detail. In the windows that opens you will see something like this. Look for the field Dialout Password. You can view your password there. There is one more very complicated way of finding your password. Check this link for that. 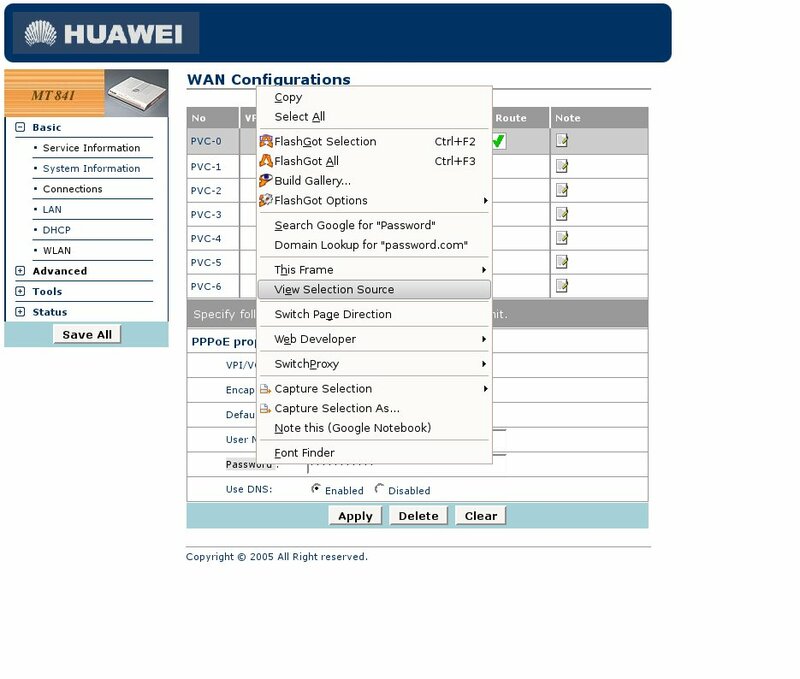 [HowTo] Restore your lost broadband password ..
Hidden user account in Huawei ADSL routers! Added the sites. Appreciation for giving. Definitely well worth enough time clear of our reports. The command pppoe show transport 1 didn’t work for me. Could you think of a possible reason.